Effy, Sam. C and Dami gave their technology presentations, and we spent the remainder of the class discussing each group’s first prototype iteration. Continue developing your idea. Next week, Michael will meet with each group to discuss the following items. 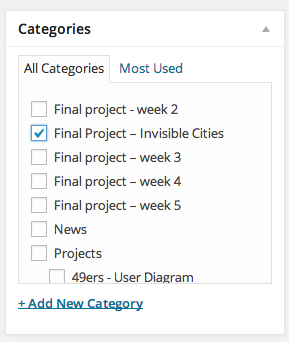 Please document your thinking in a blog post, file it under Final project – week 2, and get it up by Sunday 11/2. Test second prototype: If your group has already tested out in the field, try your next prototype in the studio. To allow enough time for interaction and analysis, prototypes should be installed by tomorrow (Thurs, 10/30). Technology projects. Next week, we’ll here from Jeff, Mini, Hanna, Amy, Michie and Mike. Hope everyone enjoyed our guest workshop! It provided a way to enrich our understanding of personas by embodying their attitudes, concerns, and interactions through improv. First prototype – Time to put our first project iterations out into the wild! This can be a paper/rapid prototype with your choice of content, medium. Please post documentation by end of day Sunday 10/26 under the Final project – first prototype category. Tech research – Next up are Jeff, Mini and Hana. Since we didn’t have time for Dami, Effy and Sam C. last week, we’ll try to squeeze in all 6 next week so please be prepared to present. Office hours: While there aren’t official office hours, you should feel free to reach out to Michael & arrange a time during the day. Michael’s office is really close by. Guest lecture: Next week, we’ll have a guest lecture from a friend of Michael’s who works at IDEO and has a background in improv. Tech research projects: If you haven’t sent Michael your topic already, please do ASAP. Technology is defined by a system that involves input > processing > output. Dami, Effy and Sam C. will present their tech research projects next class. Plan and prepare for your first in situ prototype. In order to do that you must first develop goals and parameters, do preliminary market research, define users, and focus on one single element of a goal to rapid prototype around. Elevator pitch with prototype iteration 1 proposal to present in class. G&P, Users, Market research to be posted to the blog. We took a field trip to the LED Lab and 330 Hudson to see and discuss some of Michael’s work. Fun times! Be sure to check out the partner links on the right side of the LED website. Interesting people. Here is the information for tonight’s event. It is free for students but you have to get a ticket. Step one: Email Michael to let him know which technology you want to do your project on by tomorrow, Wednesday 10/8 so that he can OK it or give you some suggestions. Deliverable: Please put together a google presentation and email Michael the link before class. Calendar events: I’ve sent everyone a calendar event for your individual due date. 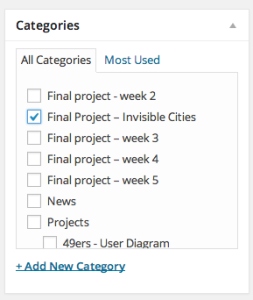 You will also get an automatic reminder 1 day before your project is due. Please let me know if you don’t have the event! Everyone now needs to start shutting down their diamond and putting together a 10 minute presentation (strictly ten minutes or less). It should show a bit of the design arc (research, goals and parameters, creation mythology) and then present the idea from the perspective of the user experience. Please post this under the 49ers Final Presentation category. During class, each group discussed their creation myths and research, and we all dove into the technology that Levi’s Stadium is equipped with. We then shifted our focus on the platform vs. product spectrum, completing an in-class exercise to better understand where our own projects might ultimately fall along the spectrum. Class will be held offsite next week (keep reading for details). Going forward, we’ll have to post major part of our HW assignments by Sunday night. Diamond process model, spotted in the wild – Michael noticed his colleagues felt better knowing where they were in the process. How do you get people to make choices with the lowest level of entry, can you leverage an existing action or give people an excuse to do something that they always wanted to or had never even thought of? How do you teach a new action that results in something that makes it worth it? Based on your Goals and Parameters come up with the first iteration of your idea. Represent it as a diagrammed user experience and post to the “49ers – User Diagram” category. How people take the experience home with them? What other technologies or platforms within Levi’s Stadium that can be leveraged in your experience? At 7:30pm we will be at 330 Hudson St. for a review of that site. We will be walking between the two (7 minutes) so bring necessary walking paraphernalia.